I recently heard of a great campaign the University is running that allows past, present and future students to share their journey through developing a short video. This really captured my imagination and got me thinking about my own journey which started many years ago back in the UK. I began my professional life as a radiographer and trained at the Northampton School of Radiography. I worked for a number of years as a radiographer in London hospitals before moving into a teaching role. This step eventually led me to Australia and into university administration. It’s been an amazing journey so far and I feel fortunate to now be leading CQUniversity and living here in this fantastic part of Australia. Many of our students have interesting and unique journeys too. Some have been in the workforce for years, or raised a family, before deciding that university study is right for them. Some have experienced setbacks and hardships on their way to university study, only to come out at the other end with a truly rewarding and fulfilling career. Others have traversed great distances (real and virtual) in choosing to study a CQUniversity program by distance education, or making the move to Central Queensland to fulfil their dreams of being a sonographer, a stage performer or an engineer. It’s an incredibly diverse mix, and it’s part of what makes us such an inclusive university. I do hope we get plenty of people sharing their journeys with us. Remember a degree is not a destination; it’s just one part of a much bigger journey. You will likely recall in the past few months, that I have spoken about what makes a great university, and more specifically what will make CQUniversity one of Australia’s great universities. Many of the responses had similar themes running through them – a belief that a great university is defined by its involvement in the community, its philanthropic activities, the study programs it delivers, interaction with students and research outputs. I completely agree with all of the above and I am constantly thinking about our ‘from strong to great’ vision. Most recently in fact, I was thinking of all the things that already make us great, and the most obvious thing to me was our people. CQUniversity is very lucky to have a number of very dedicated academic and professional staff. Staff who are leaders in their field, staff who innovate, and staff who I constantly see going that extra mile to deliver a first class service to our students and engage with our community. Last week we held our annual staff awards ceremony, which is one of the highlights of the University calendar. This year was a real standout though, as some of the people we recognised have delivered completely remarkable contributions to CQUniversity and their local community. In particular I would like to make mention of Kathy Ramm and Ron Wallis – who were recognised for 35 years of service to the university. I find it truly amazing that Kathy and Ron have built their careers around our university – even more amazing is that I was just a kid when they first started! I’d like to personally thank all our award recipients, as well as all CQUni employees for making this university what it is. With your continued dedication we will be able to make CQUniversity a great university. It’s fantastic when a project comes together that combines community engagement and ‘giving back’ with real-world educational opportunities for CQUniversity students. The AEIOU Early Intervention Centre at Bundaberg is one such project. The development, construction of which has just begun at CQUniversity’s Bundaberg campus, is funded by a Queensland Government commitment of $700,000 and will provide full-time support to 12 local families with autistic children. The learning centre will help children with autism learn vital life skills, like the ability to communicate their needs, their wants and their feelings, and to understand and engage with people and the environment around them. Along with this CQUniversity education students will also benefit from work placements and research collaboration opportunities. This is an exciting partnership for CQUni and the AEIOU foundation. The centre should be up and running by mid next year – can’t wait for a tour! When the CQUniversity Allied Health Clinic was officially opened by Federal Health Minister Tanya Plibersek, she made a valid point to the crowd that attended that students who gain professional experience at facilities such as this will be more likely to seek out professional placements in rural and remote communities going forward. And I for one completely agree. 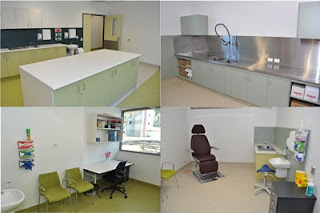 Even though this clinic is based in Rockhampton it is already providing value to residents from across the entire Central Queensland region, through the delivery of specialist and preventative health care treatment, which aims to treat chronic and complex illnesses and keep patients well and out of hospital. Despite only being open to patients since August, already more than 2,000 people from several CQ communities have visited and received treatment in the clinic. Patients however, aren’t the only ones benefiting – students are also gaining huge value from being placed within the clinic and learning from health professionals who are leaders in the field. With the clinic now providing up to 200 placements per year for students - from nine universities – including CQUniversity, this will have an extraordinary impact and flow on effect on the future of healthcare in our region. It goes without saying that it is beyond difficult to attract skilled professionals to regional areas, but through providing students with a quality learning experience and a taste of the ‘real Australia’, I really believe that they will be more likely to stay or relocate to our region to commence practice in their chosen field after graduating. Demand for health care is always increasing and by having this clinic in our backyard Central Queensland is most certainly on the front foot for attracting and retaining the professionals of the future. As I’ve mentioned many times before, students who study local are also more likely to stay local, and I am pleased to be a part of a university that will deliver quality graduates to the region, who will fill current and future skill shortages - not just in health care but other industries as well. This focus is good for the community, good for the economy and good for regional sustainability.